File photo of Nagaland CM Neiphiu Rio. The Naga People’s Front (NPF) has lashed out at the Nagaland unit of JD (U) for appealing to people to accept the clarification given by chief minister Neiphiu Rio on Naga area integration issue. The state JD (U) made the appeal through a press statement that appeared in local dailies on July 7. In a press release on Monday, the NPF asked the JD (U) as to why it should blindly accept the clarification given by the chief minister on integration of Naga contiguous areas. It said if the JD (U) is satisfied with the clarification given by Rio they should clear their position without interfering in other political party’s stand. “The JD (U) cannot insist the NPF to be satisfied with CM’s clarification. As far as the NPF is concerned, the aims and objectives of the NPF constitution categorically emphasized on integration of contiguous Naga areas and therefore, it will continue to pursue till it is achieved,” the NPF release stated. The NPF argued that when the Naga national workers and the government of India are trying hard to work out the solution, it is too premature to announce by the chief minister that the integration is not possible. 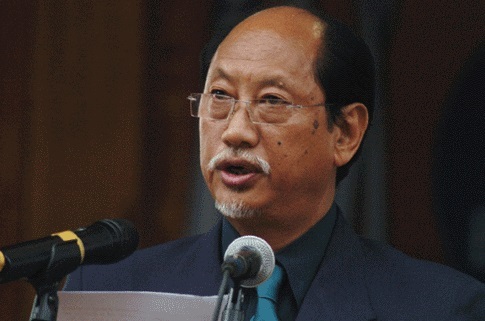 According to the Opposition party, the clarification given by the Nationalist Democratic Progressive Party (NDPP) blaming the media as misinterpretation of Rio’s statement which was followed by the chief minister’s clarification that he was simply interpreting Union Home Minister Rajnath Singh’s view are an attempt to mislead the Naga public and pose a hurdle on the ongoing peace process. Therefore, the NPF said, the issue is not concluded here and added that it will never consider the chief minister’s clarification as putting the issue to rest. The NPF also wondered as to why the People’s Democratic Alliance (PDA) government is still keeping silent over the controversial Citizenship Amendment Bill 2016 without clarifying to the people why it will not oppose the Bill. “When the whole neighbouring northeastern states particularly even the BJP ruled states, Manipur and Assam, are opposing the Bill, the PDA government has not pointed out the benefit of enforcing the Bill into the Naga soil,” the NPF stated. Maintaining that it is not raising the two pertinent issues for the sake of being an opposition party, the NPF stressed that the government of the day should take a decision concerning the Naga society keeping in mind the welfare and the prosperity of its people. The NPF warned that the future of the Naga people should not be politicised just for the sake of the chair and funds.